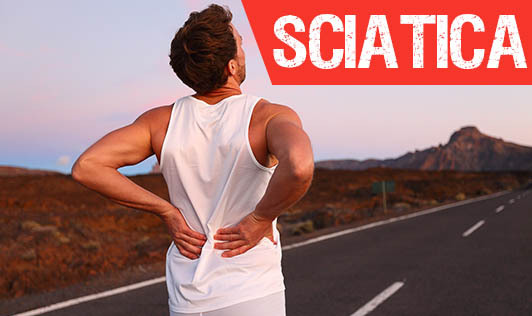 Sciatica is a set of symptoms including pain that may be caused by general compression and/or irritation of one of five nerve roots that give rise to the sciatic nerve or by compression or irritation of the sciatic nerve itself. Herniated Disc: Sciatica can result when one of the vertebral discs of the lower back protrudes outward and compress the nerve roots that form the sciatic nerve. This compression irritates the nerve and causes swelling and pain along the sciatic nerve. Herniated discs are the most common cause of sciatica. Lumbar Spinal Stenosis: Lumbar spinal stenosis refers to a narrowing of the spinal canal in the lower back region. When the spinal canal becomes narrow in this area, it can compress portions of the nerves that combine to form the sciatic nerve. Piriformis Syndrome: The piriformis is a small muscle located deep in the buttock region. It assists in abducting (lifting out) and externally rotating the hip joint. The sciatic nerve runs extremely close to the piriformis muscle, and occasionally runs through it. As a result, when the piriformis muscle becomes tight, it often puts pressure on the sciatic nerve causing irritation and inflammation.